When librarian Laura Griffith's sixteen-year-old sister disappears on a frigid February day, leaving only a brief note behind, Laura resolves to do whatever it takes to track down the runaway teen. That includes recruiting ATF agent turned PI James ""Dev"" Devlin to help. But the deeper he digs, the more he begins to suspect that something sinister is at work in the girl's disappearance. And the closer he gets to uncovering the truth, the clearer it becomes that the situation isn't just dangerous--it's deadly. 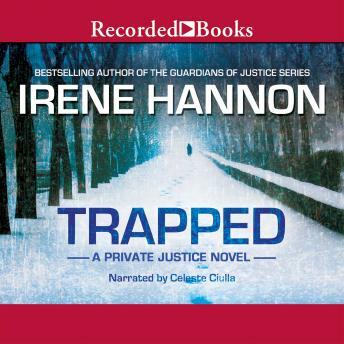 Chilling and at times terrifying, Trapped is the latest thrilling read from Irene Hannon, the queen of romantic suspense. Hannon outdoes herself with this fast-paced tale of fear, deception, and just the right dose of romance.